While filming the movie Lock Up Your Daughters! (1969) co-starring Susannah York, Glynis Johns, and Elaine Taylor in Ireland in 1968, Christopher Plummer and Elaine Taylor fell in love. "Oh, yes, we tumbled into bed and all that, but I didn't like you very much. I thought you were the most conceited prig--the way you ponced about in that big convertible of yours. And you drank far too much--but there was something, I suppose..."
"Just look at yourself in the mirror. You think you’re so attractive when you drink. You’re not. You are not a charming drunk." During the 1970's, Christopher Plummer continued to enjoy leading-man roles on stage, television and in the movies. He won his first Tony Award in 1974 for his performance as Cyrano de Bergerac in the Broadway musical Cyrano (from May-June 1973). On television, he won his first Emmy Award as Outstanding Lead Actor in a Limited Series in 1977, for The Moneychangers. After the Fall (1974), a TV drama with Faye Dunaway and Bibi Andersson. Faye Dunaway and Christopher Plummer would also co-star in Ordeal by Innocence (1984). The Day That Shook the World (1975) with Maximilian Schell. In 1991, Christopher Plummer and Maximilian Schell worked together again in the historical TV movie Young Catherine (1991); their co-stars in Young Catherine included Franco Nero, Julia Ormond, and Marthe Keller (his co-star from The Amateur, 1981). The Man Who Would Be King (1975); Plummer played poet-author Rudyard Kipling, with co-stars Sean Connery and Michael Caine. The Man Who Would Be King was the 3rd movie for Michael Caine and Christopher Plummer, after co-starring in Hamlet at Elsinore (1964) and Battle of Britain (1969). The Silent Partner (1978) with Elliott Gould was the 4th movie for Susannah York and Christopher Plummer. Their first 3 movies were Battle of Britain (1969), Lock Up Your Daughters! (1969) and Conduct Unbecoming (1975). Waterloo (1979) with Rod Steiger and Orson Welles. Plummer had co-starred with both men before; with Orson Welles in Oedipus the King (1968), and Rod Steiger in the mini-series Jesus of Nazareth (1977). By the early 1980's and the beginning of his 50+ years, Elaine and Christopher Plummer had moved to the U.S., in part to escape British taxes. The Plummer's bought an old farmhouse in Connecticut and were busy renovating it when interviewed by People magazine in March 1982; in 2015 it sold for over $11 million. Joanne Woodward, Valerie Harper, and John Considine in the TV movie The Shadow Box (1980). The Shadow Box was directed by Woodward's husband Paul Newman. Jane Seymour, Christopher Reeve, and William H. Macy in the historical romance Somewhere in Time (1980). In the TV mini-series Crossings (1986), Christopher Plummer and Jane Seymour's co-stars included Cheryl Ladd, Lee Horsley, and Kelsey Grammer. William Hurt, Sigourney Weaver, James Woods, Pamela Reed, and Morgan Freeman, in the mystery Eyewitness (1981). Beverly D'Angelo, Saul Rubinek, and Maury Chaykin in the comedy thriller Highpoint (1982). In the 1990 comedy Where the Heart Is, Plummer and Maury Chaykin co-starred again, along with Dabney Coleman, Uma Thurman, Joanna Cassidy, Crispin Glover, and Suzy Amis. Angela Lansbury, Rosalyn Landor, J. T. Walsh and Glynis Johns, in the TV drama Little Gloria...Happy at Last (1982). Glynis Johns and Christopher Plummer had co-starred previously, in the 1969 movie Lock Up Your Daughters!. Gregory Peck and John Gielgud in the TV movie The Scarlet and the Black (1983). John Gielgud and Plummer had first appeared onscreen together in the 1976 movie Aces High. Maggie Smith and Elke Sommer in the comedy Lily in Love (1984). The Thorn Birds (1983) TV miniseries was based on author Colleen McCullough's epic best-selling novel. Richard Chamberlain, Rachel Ward, Bryan Brown, Barry Cobin, John de Lancie, Piper Laurie, Earl Holliman, Mare Winningham, Sydney Penny, and Rance Howard co-starred with Christopher Plummer in the equally popular The Thorn Birds mini-series. Christopher Plummer was nominated for a Primetime Emmy Award for Outstanding Supporting Actor in a Miniseries or a Movie, for his performance as an Archbishop in The Thorn Birds. By the mid 1980's, 50+ Christopher Plummer began to appear in more supporting roles vs as a leading man. He also began to take on voice-acting roles, and could be heard in animated movies such as The Velveteen Rabbit (1985). Plummer was a regular on the TV series Counterstrike (1990-1993), co-starring with Simon MacCorkindale. Simon MacCorkindale and Plummer later co-starred in The Dinosaur Hunter (2000), a TV adventure movie. Dragnet (1987), a comedy co-starring Dan Aykroyd, Tom Hanks, Elizabeth Ashley, and Dabney Coleman. Dan Aykroyd and Christopher Plummer would co-star again in the Canadian TV movie The Arrow (1997), along with Michael Moriarty and Michael Ironside (Michael Ironside and Plummer had co-starred in the 1989 thriller Mindfield). Money (1991) co-starring with Eric Stoltz, Maryam d'Abo, F. Murray Abraham, and Danny DeVito. The next year, Plummer had a small role in the TV thriller The First Circle (1992), with Victor Garber and F. Murray Abraham. A Marriage: Georgia O'Keeffe and Alfred Stieglitz (1991), a TV movie starring Christopher Plummer as Alfred Stieglitz and Jane Alexander as Georgia O'Keeffe. 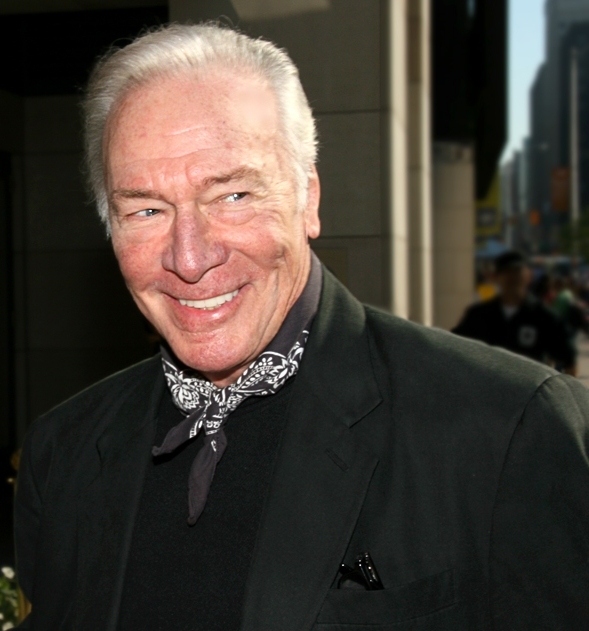 Christopher Plummer continued to do more voice-acting work throughout the 1990's. He was the narrator in several animated "Madeline" movies, and won his second Emmy Award for his narration in the animated Madeline TV series (1993-1994). Baby boomers and their children might remember hearing him voice the Grand Duke in the animated feature film Rock-A-Doodle (1991). Wolf (1994), a horror movie starring Jack Nicholson, with Michelle Pfeiffer, Jamea Spader, Kate Nelligan, Richard Jenkins, David Hyde Pierce, Ron Rifkin, and David Schwimmer. Dolores Claiborne (1994), a mystery with Kathy Bates, Jennifer Jason Leigh, Eric Bogosian, and John C. Reilly. Twelve Monkeys (1995), a sci-fi thriller in which he played a doctor; the movie starred Bruce Willis, Madeleine Stowe, Brad Pitt, and Christopher Meloni. Christopher Plummer was a senior citizen when he won his second Tony Award in 1997 for his Leading Actor performance on Broadway in Barrymore. 14 years later, a now octogenarian senior Christopher Plummer would star as Barrymore (2011) in what was essentially a one-man movie. Skeletons (1997), a thriller with Ron Silver, Dee Wallace, James Coburn, and Kathleen Noone. A few years later, Ron Silver and Christopher Plummer were co-stars again in the TV comedy American Tragedy (2000) with Ving Rhames and Bruno Kirby. Winchell (1998), a historical drama with Stanley Tucci, Glenne Headly, Kevin Tighe, and Paul Giamatti. Plummer played President Franklin D. Roosevelt in Winchell. In 1999 Christopher Plummer became a septuagenarian senior citizen. He continued to do even more voice acting, in video games and animated movies, and can be heard in the box-office and critically successful movie Up (2009) as Charles Muntz. The Insider (1999) saw Christopher Plummer co-starring as Mike Wallace, in a movie with Russell Crowe, Al Pacino, Philip Baker Hall, Debi Mazar, Colm Feore, Gina Gershon, Michael Gambon, Rip Torn, Lynne Thigpen, Wings Hauser, Gary Sandy, and Breckin Meyer. Plummer has said that his portrayal of Mike Wallace , and working with Russell Crowe in The Insider, was a highlight of his career. He had worked with veteran actor Rip Torn 40 years earlier, in the TV movie Johnny Belinda (1958). A few years later, Christopher Plummer worked with Russell Crowe again in the hit movie A Beautiful Mind (2001). Their co-stars in A Beautiful Mind included Ed Harris, Jennifer Connelly, Paul Bettany, Adam Goldberg, Josh Lucas, Judd Hirsch, Roy Thinnes, and Rance Howard. Actor Paul Bettany and Plummer would co-star again in the movie Priest (2011). Nuremberg (2000), a miniseries co-starring Alec Baldwin, Jill Hennessy, and Max von Sydow. Max Von Sydow and Plummer would be reunited in the 2007 drama Emotional Arithmetic). Possessed (2000), a TV horror movie co-starring Timothy Dalton, Piper Laurie, and Kathy Bates. Plummer and Piper Laurie had both appeared in the 1983 miniseries The Thorn Birds, 27 years earlier; and he had co-starred with Kathy Bates in the 1994 movie Dolores Claiborne. Ararat (2002), a Canadian drama co-starring with Charles Aznavour, Brent Carver, Eric Bogosian (another co-star from Dolores Claiborne in 1994), and Bruce Greenwood. Plummer was nominated for Canada's Genie Award for his performance in Ararat. The TV mini-series The Summit (2008) brought Bruce Greenwood and Plummer onscreen again. Cold Creek Manor (2003), a thriller co-starring Dennis Quaid, Sharon Stone, Stephen Dorff, and Juliette Lewis. Dennis Quaid and Plummer had co-starred with Max Von Sydow in 1984's Dreamscape, almost 20 years earlier. National Treasure (2004) had Christopher Plummer co-starring as John Adams Gates, father of star Nicolas Cage's character. Fellow cast members in National Treasure included Sean Bean, Jon Voight, and Harvey Keitel. Nicolas Cage and Plummer had first appeared onscreen together almost 20 years earlier, in the Canadian movie The Boy in Blue (1985) with Cynthia Dale, Jeff Wincott, and Kim Coates. Our Fathers (2005), a TV drama co-starring Christopher Plummer, Ted Danson, Brian Dennehy, Daniel Baldwin, Ellen Burstyn, Kenneth Welsh, and Jan Rubes, explored the subject of sexual abuse within the Catholic Church. Christopher Plummer was nominated for a Primetime Emmy Award for Outstanding Supporting Actor - Miniseries or a Movie, for his performance as Cardinal Bernard Law in Our Fathers. Syriana (2005), a political thriller co-starring George Clooney, Matt Damon, Amanda Peet, Chris Cooper, Robert Foxworth, and Jamey Sheridan. Must Love Dogs (2005), a romantic comedy-drama co-starring Diane Lane, John Cusack, Elizabeth Perkins, Dermot Mulroney, and Stockard Channing. Plummer plays a widowed father of grown daughters (Diane Lane), who is happily playing the field as a single senior in Must Love Dogs (which by all accounts, Plummer does). The Lake House (2006), a romantic fantasy co-starring Keanu Reeves, Sandra Bullock, and Dylan Walsh. Irish actor Colin Farrell and Christopher Plummer co-starred in 3 movies between 2004-2009, beginning with the historical biography Alexander (2004). Their Alexander co-stars included veteran actors Anthony Hopkins (whom Plummer had co-starred with in the 1978 movie International Velvet, and Val Kilmer. The following year, The New World (2005), a historical biography saw Colin Farrell and Plummer onscreen with August Schellenberg, Christian Bale, Wes Studi, Michael Greyeyes, and Jonathan Pryce. Their third film was The Imaginarium of Doctor Parnassus (2009), in which Christopher Plummer played the title character Doctor Parnassus. The Imaginarium of Doctor Parnassus also featured singer Tom Waits as Mr. Nick, and actors Heath Ledger, Johnny Depp, and Jude Law. Not content with providing Emmy-nominated performances during his 70's, Plummer also continued to appear on stage. He garnered two more Tony Award nominations, for his performances on Broadway as King Lear in King Lear (2004), and as Henry Drummond in Inherit the Wind (2007). The Last Station (2009) with co-stars Helen Mirren and Paul Giamatti. Paul Giamatti and Plummer had co-starred in the 1998 TV movie Winchell 20 years earlier. Both Helen Mirren and Christopher Plummer were nominated for Academy Awards for their performances as author Leo Tolstoy and his wife Sofya, in The Last Station. Inside Man (2006), a mystery starring Denzel Washington, Clive Owen, Jodie Foster, and Willem Dafoe. Plummer had a minor role as a chaplain in Denzel Washington's earlier movie Malcolm X (1992). The Girl with the Dragon Tattoo (2011), co-starring Daniel Craig, with veteran actors Stellan Skarsgård, Robin Wright, Joely Richardson, and Goran Visnjic. The Girl with the Dragon Tattoo was a critical and commercial hit. Plummer and his The Girl with the Dragon Tattoo co-star Stellan Skarsgård were re-teamed onscreen in the critically-panned comedy Hector and the Search for Happiness (2014) with Simon Pegg and Jean Reno. Muhammad Ali's Greatest Fight (2013), a drama with Frank Langella, Ed Begley Jr., and Danny Glover. Christopher Plummer won his first Academy Award for his Supporting Actor performance as dying father and widower Hal Fields, in the romantic comedy Beginners (2010). His plays a senior who finally comes out of the closet; Ewan McGregor is his on-screen son Oliver Fields, Goran Visnjic is Hal's younger lover, and Mary Page Keller is Oliver's mom. At age 82, Christopher Plummer became the oldest actor or actress to win an Actor Academy Award. Plummer told The Globe and Mail in 2012 that to keep physically and mentally fit as an octogenarian senior, he still works out regularly at a gym and watches what he eats. To spare his knees, he'd just given up playing tennis. In the movie Elsa & Fred (2014), actress Shirley MacLaine and Christopher Plummer portray a pair of heart-tugging seniors near the end of their lives, who discover achieving their dreams and true love are both still within their grasp. Co-starring with them in Elsa & Fred were George Segal, Marcia Gay Harden, Chris Noth, James Brolin, and Scott Bakula. Plummer had with Shirley MacLaine before, in the film Closing the Ring (2007) starring Neve Campbell. 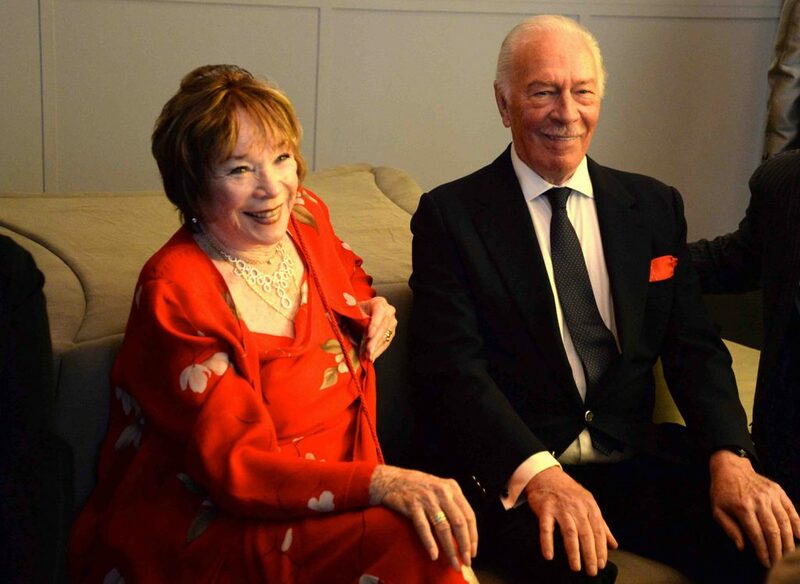 Below, Shirley MacLaine and Christopher Plummer at the 2014 Miami Film Festival opening night, to promote Elsa and Fred. Most recently, octogenarian senior citizen Christopher Plummer could be seen by his senior and baby boomer fans in Danny Collins (2015) with Al Pacino, Annette Bening, Jennifer Garner, and Bobby Canavale; and co-starring as Kaiser Wilhelm II in The Exception (2016) with Lily James. In the Canadian-German feature film Remember (2015), Christopher Plummer co-stars with Martin Landau as elderly Holocaust survivors on a quest to bring a concentration camp nemesis to justice. Landau's character cannot physically leave their long term care centre, and Plummer's character should not (he has dementia). Christopher Plummer and Martin Landau had co-starred together several times before, beginning 24 years earlier with the sci-fi thriller Firehead (1991), which included actors Chris Lemmon and Landau's girlfriend Gretchen Becker in the cast. They were paired onscreen again in Mistress (1992), and worked together in the animated movie 9 (2009). Currently 4 projects are in the works for Christopher Plummer in various stages - a schedule that would make many a younger actor green with envy. He's filming The Man Who Invented Christmas, starring as Ebenezer Scrooge, with Jonathan Pryce; and Cliffs of Freedom with Billy Zane. Plummer is set to begin filming the movie The Last Full Measure, and has completed filming on Boundaries with Christopher Lloyd and Vera Farmiga, Bobby Cannavale, and Peter Fonda; Boundaries is set to premiere in 2017. In 2016, Christopher Plummer and his wife Elaine celebrated their 46th wedding anniversary. Happy 87th Birthday, Christopher Plummer!